The official Raspberry Pi Beginner's book comes with everything you need to get started with Raspberry Pi today. 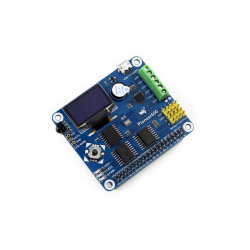 Note : the Pi, cables and sensors are NOT included. The official Raspberry Pi Beginner's book comes with everything you need to get started with Raspberry Pi today! Inside you'll find a Raspberry Pi Zero W, the official case (with three covers), SD card with NOOBS pre-loaded, not to mention USB and HDMI adapter cables. The accompanying 116-page book is packed with beginner's guides to help you master your new Raspberry Pi! Learn how to harness the energy of the sun in your Electronics and Design and Technology projects with our new Solar Power Starter Kit. With this kit it is possible to build a simple solar charging and power supply system for a variety of useful low power devices. As of 2017, renewable energy accounted for more than 25% of energy produced in the UK for the year. Environmental targets are such that this is set to increase year on year. Solar power is already a key player in the renewable energy market and there is the potential for it to grow much larger still. It has been estimated that covering just a fraction of the Sahara Desert in solar panels would provide enough electricity to power the energy needs of the whole world! The Solar Power Starter kit itself is a simple kit to build and understand. Once the kit has been set up and placed in direct sunlight the batteries will begin to charge. If the light level is insufficient to facilitate charging, the diode prevents any of the charge held in the batteries from discharging back through the solar cell. The supplied switch enables you cut power to the kit that you are powering for greater recharging efficiency. If used with the included Kitronik LED Desk Lamp Kit, for example, fully charged batteries will provide light for up to 17 hours, more than enough for a little light reading. This kit requires assembly and some soldering. The kit does not contain any connecting wire, you will need to use wire like Multi-stranded Wire. Harness the energy of the sun and add simple solar charging and power supply to your low power devices. Learn about renewable energy and how simple it can be incorporate into your designs. A Small Signal Schottky Diode is supplied to protect against accidental discharging of the batteries through the solar cell. 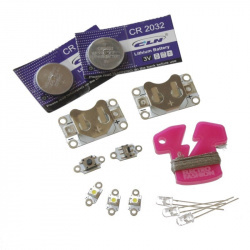 2155 5V LED Desk Lamp Kit-Included with the Solar Power Starter Kit. 2157 FM Radio Kit V2.0. 2165 Mono Amplifier Version 3.0. 1 x 5.0V 130mA Polycrystalline Solar Cell. 1 x SPST Toggle Switch. 1 x 5V LED Desk Lamp Kit. 1 x 3x AA Battery Holder with Flying Leads. 3 x Rechargeable AA Battery (1300mA/h). This pack is a great way to get started with E-Textiles. We have selected a number of products from our Electro-Fashion range, including three of our ultra-slim LEDs and two seperate power boards. 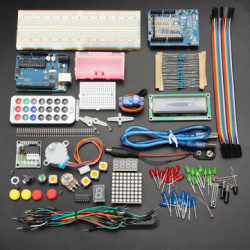 There are enough components for you get started immediately to create some eye catching E-Textiles projects, the only limit is your imagination. Everything you need to complete two projects. 2 x Coin Cell Holder. 3 x Sewable LEDs White. 3 x Flashing LEDs White.